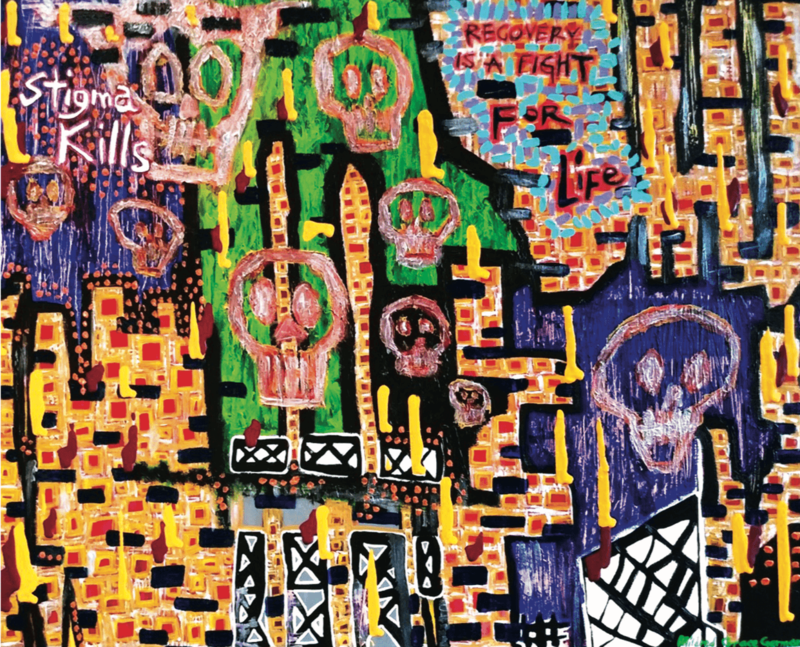 In Mildred Grace German’s piece Stigma Kills, the artist aims to depict how mental illness and addiction can affect anyone, regardless of their background or location. The artwork was inspired by the ongoing battle for social justice in Vancouver’s Downtown Eastside, where German lives. The piece was on display at the University of British Columbia as part of a student art show exploring the impact of the opioid crisis from a youth perspective. It was the second day of the Calgary Stampede, a 10-day bonanza of cowboy-themed festivities in the Canadian province most stereotyped by its beef, oil, and country music. Nearly every local business had shut down for the week. “It’s our biggest holiday. You just don’t mess with the Stampede,” Calgary-born Mandy Alston tells me nearly a year later. The 27-year-old has worked in the hospitality industry for the better part of her adult life, and most of her friendships were established in restaurants, bars, and while hosting corporate events. In Alston’s industry, there is little talk about research-based solutions to addiction or behavioural interventions for mental health. Friends would respond to everything by suggesting a drink or a line. “It’s a supported addiction,” she says. Alston was teaching spin classes while running restaurants and working for clients, so she felt she had to hide her vulnerabilities. Cocaine, she says, helped her remain positive around others. She could still be the happy, peppy person that everyone knew. “No one had to know that I was going through pain,” she says. The first time Alston used cocaine was with her ex on vacation in Mexico on New Year’s Eve. She started to work in nightclubs more often, planning and hosting events. “Cocaine was readily available. At first I didn’t like that because I couldn’t sleep,” she says. She stopped doing it for a while, but she then figured out what she calls “the balance.” “It was a quick line here and there and with that came a drink. I would do a line and think, ‘Now I need a drink,’” she says. “The habit formed so fast that I thought, ‘Wow, I’m in this,’” she remembers. In healthy brain functioning, highly pleasurable “rewards” are experienced in the limbic system—the brain’s more primal, impulse-driven centre—and rational thoughts about responsibilities and consequences happen in the prefrontal cortex. In addiction, the former overrides the latter: the decisions made in the rational system of the mind are vetoed by the reward-driven system of the mind. The good news is that many in the field of addiction and mental health are beginning to understand this and are working toward solutions that help take back the prefrontal cortex’s control. Medication-assisted treatment (MAT) programs are on the rise, and could be a solution for many. MAT combines psycho-social interventions like cognitive behavioural therapy (CBT) with medications that are offered on a 30- to 60-day plan to reduce the endorphin reward. This lessens the reward-seeking drive so the brain can go back to commanding our actions rationally. Stone’s program combines evidence-based practices in two worlds that he believes are closely related, but that don’t often intersect: the world of psychotherapy and the world of medicine. On the medical side, Alavida uses the opioid antagonist Naltrexone, which partially blocks opioid receptors so that they can’t fully deliver the pleasure they normally do. “[These medications are used] as a tool to essentially retrain the brain and to make the process of paring down your drinking easier from a biological sense,” he explains. When you don’t get the neurochemical reward, then you aren’t as inclined to seek the substance that delivers it. “If [we’re] able to block that reward for a period of time in specific circumstances, it can pull someone out of that compulsive cycle and give them a bit of space to make decisions,” Stone explains. And that space is where his program really doubles down on the psychotherapy aspects like CBT, motivational interviewing, and traditional therapy. Because her case was less severe than many addicted to alcohol, on her own, Alston was able to figure out how to achieve some of the components that successful treatment plans like Stone’s and other MAT programs incorporate. She moved from Calgary to Vancouver to get away from her triggers that set her reward-seeking behaviour in the driver’s seat, and sought out relationships that didn’t expect her to be happy and peppy all the time, or those who suddenly became too busy when things got tough. People who, when she’s going through a rough patch, don’t just resort to buying her a shot. “I’m cooking dinners, I’m being honest, and I’m enjoying my life,” she tells me happily.